Proust, Virginina Woolf, and the dangers of loving a book too much. I’ve been thinking back to one of my first posts, listing the ten reasons why people should join in the reading of reading Proust. 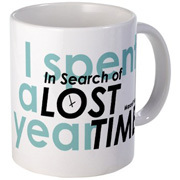 In it I quoted Virginia Woolf’s famous line, “My great adventure is really Proust. Well — what remains to be written after that?” In reading Alain de Botton’s How Proust Can Change Your Life,” I read about the danger that such feelings had for Woolf. “Reading Proust nearly silenced Virginia Woolf. She loved his novel, but loved it rather too much. There wasn’t enough wrong with it, a crushing recognition when one follows Walter Benjamin in his assessment of why people become writers: because they are unable to find a book already written which they are completely happy with. And the difficulty for Virginia was, for a time at least, she thought she had found one. Virginia Woolf first mentioned Proust in a letter she wrote to Roger Fry in the autumn of 1919. He was in France, she was in Richmond, where the weather was foggy and the garden in bad shape, and she casually asked him whether he might bring back a copy of Swann’s Way on his return. The tone suggests that Woolf had at last made her peace with Proust. He could have his terrain, she had hers to scribble in. The path from depression and self-loathing to cheerful defiance suggests a gradual recognition that one person’s achievements did not have to invalidate another’s, that there would always be something left to do even if it momentarily appeared otherwise. 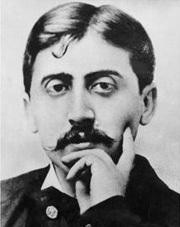 Proust might have expressed many things well, but independent thought and the history of the novel had not come to a halt with him. His book did not have to be followed by silence, there was still space for the scribbling of others, for Mrs Dalloway, The Common Reader, A Room of One’s Own, and in particular there was space for what these books symbolized in this context, perceptions of one’s own. This sums up the reader’s crisis as well after having read Proust. I say with some trepidation given our next adventure as a group that reading Crime and Punishment this year (which I have read many times) was a shock at first. The prose felt completely dead and something I’ve regarded as a masterpiece felt terribly flat. I got over it. But it’s not Proust. And I fear that “But it’s not Proust” will be a pretty constant refrain after nearly everything I read. Nope, it’s not Proust. But what is? On the other hand, it’s far enough away from Proust and his world and his style and his everything that it seemed to me it would definitely work — you can’t compare them, they’re just too different. Sold! Thanks for helping get me unstuck from Proust. I’m sure one of the roles you’ll be playing is coaxing us all through this transition to another author. There are enough references to Dostoevsky in ISOLT, however, to make it of considerable comfort to know that Proust read him, too.